2 or 3 years ago I played around with making a peizo print head, whilst rummaging through some draws I came across a bag with the bits inside and thought it might be worth sharing, someone may be interested?. at about 50p each, (buzzers), on a visit to my local poundland I purchased 3 bicycle buzzers to get the bimorphs as well as the drive electronics, the electronics are quit simple, a pulse generator feeding into a miniature step up transformer. 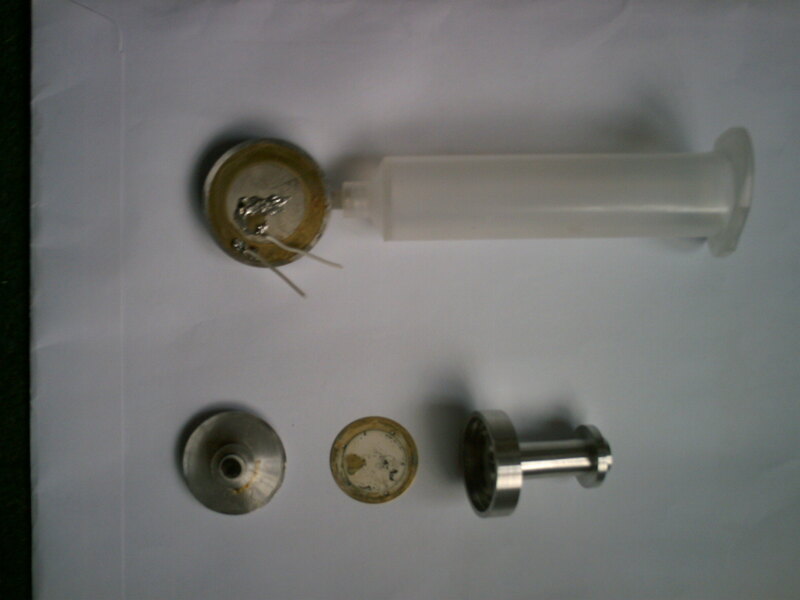 "nothing", more head scratching, then added a reservoir in the form of a syringe without the plunger, success, I then tried vodka, again success but water would not go through. I used the insert from a spray can for the nozzle, a ne555 into a small transformer for the driver, I can vary the frequency and amplitude, the nozzle hole could do with being smaller but the results are very encouraging, its interesting to see the liquid spray out, as the frequency varies so does the spray pattern. The main reason for doing this was the desire to print fluids that a standard print head can not cope with, they tend to be very fussy about viscosity and give up the ghost at the slightest excuse, a single printhead will never be as fast but mounted on a plotter above a powder bed similar to reprap, and using skeinforge or similar ??????. If anyone is even slightly interested I will post some images, my ancient digital camera looses battery power within minutes. It sounds interesting. What sort of resolution can you achieve? size mainly I suppose, as well as frequency and amplitude, I intend to revisit this project when time permits, as I believe that the binder is critical to the final strength of parts, and standard printheads limit the materials they can pass through. I will charge my camera and post images so that others can have a go if they wish. I would be very interested to see pictures! Cool! Would you like to put them in the wiki so that they become official documentation (™)? You may want to use scaffolding from http://reprap.org/wiki/Example. 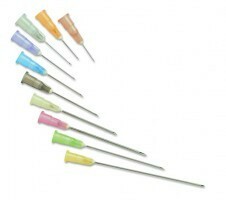 but I do not know the hole size at present, maybe around .1mm to .2mm ?. be used to drive them perhaps. Very nice. Like Peter, I would be interested in additional details you are willing to post. can not tell it as a finished story, I had forgotten about it until I found the bag of bits, I have followed reprap for a long time and know how creative the community are, and as I support open source/ hardware wanted to share it. of it at some point. I have started on the wiki page, scratch built piezo print head and added it to the development list, its a work in progress and has already taken more time than the actual experiments, I will re-do the experiments and take images this time, I also added my mistmaker observations as it is also a piezo unit. Edited 1 time(s). Last edit at 07/29/2010 03:59AM by johnrpm. I think your work is very important for everyone and for RepRap project. Right now it is a 3D printer (also a plotter) and in the future in can be a 2D ink printer. I am more interested on PCBs, because I verified that Epson DuraBrite ink resists very well to water and finger press!! It must work very well against enchant. I will be following your work, on wiki page and this forum message. I will try to help when I can, maybe testing some hardware. I am ready to build an electronics company and we plan to commercialize (and Open Source for sure) a RepRap board with ARM 32bits @ 100MHz. I would love to help prototype and commercialize the electronics for your print head. At RepRap, I believe there are users that have knowledge and tools to make the mechanical parts and others the electronics, like the 0.5mm nozzle (mechanical) or the electronics boards. For this project I could help on some part of the electronics but I can't on mechanical and so I need that someone could provide me a prototype of your print head. As for electronics, could you please document/make a schematic? (please use KiCad if possible because is OpenSource and good). People is being working with Arduino and piezos, so they should be easy to find and cheap. Edited 3 time(s). Last edit at 08/02/2010 10:41AM by casainho. Version one is as simple as it gets, a piece of alluminium machined to take the size of bimorph you are using, with a pocket to take the fluid, I did not do any maths, just by instinct, maybe the volume of fluid plays a part and I was lucky, but if you keep it to a minimum it may be better, the tricky bit is the small hole, by placing a ball bearing over the hole and hitting it with a hammer it reduces the size, if you go to far, (like I did) you then have to open it up again, I used to be into horology many years ago so had some watch reamers, these are seriously small square taper reamers, (it may be possible to use watch jewels as the hole). with a ratio of 20 to get 100 volts, I would choose 25 or 30 for future use. When I have time I will put some (refill) ink in the head and try to show the output, the jet itself is hard to see but the result on paper should give an idea, I will just move some paper about under the head whilst it is working, I hope the results are good enough?. I bought my nozzle/heater barrel from reifsnyderb on Ebay, he is selling drilled nozzles with 0.25mm. Maybe we can ask him for help to make such a small drill? Could you please make a mechanical sketch/design of your printhead? maybe later we could ask to sellers/users/hackers as reifsnyderb for a prototype. Can you produce a prototype? About that cheap piezos, I already tested one and found that it could generate about 100V or 150V while I "kick" it. That voltage almost disappears if I put some load. I put an LED directly to that 100V and the LED quickly turned on when I "kick" the piezo. So, piezo may have high input impedance. I believe that transformer your are talking can be easily prototyped and also that square wave, which we can make with a microcontroller, maybe a PWM output and vary the frequency and duty cycle. Since I understand by your description on wiki page, if we have a 6kHz signal we should have a smooth jet. What if we need to quickly stop that jet? we just need to stop the signal? And to start the jet, the same? will the ink remain on printhead if there is none signal? I don't understand how the input of the ink/liquid management is done. Is there any valve that just let's pass the liquid in the input direction? On RepRap, we can't start/stop quickly the molten plastic filament from extruding, that's why I would like to know if we could do it with ink and your printhead. Amplitude... this effects the distance the jet travels, and again appears pretty linear in response, going from 0 to 110 volts on the dial results in the jet traveling from 0 to 150mm. 150mm seems a lot to me!! We should have no need of 150mm but maybe 10 or 20mm will be enough. 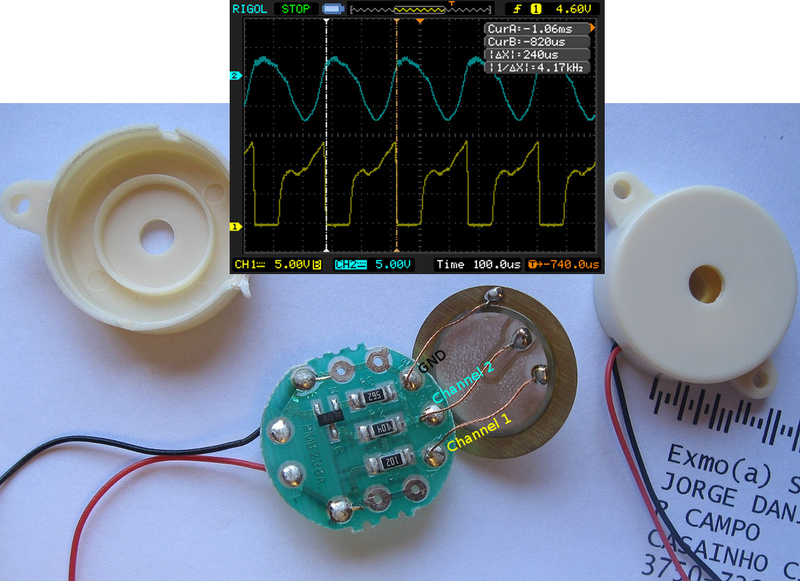 If we have a circuit that have a square wave of PWM, duty-cycle 50%, frequency 5kHz, 12V (jet travel of 16mm?? ), it should work, no? we just need to use a mosfet to switch on/off a 12V signal. What do you think? If we have that hardware + firmware working, maybe we can attach them to RepRap and control it using the software/gcode we are using for plotting. Edited 3 time(s). Last edit at 08/03/2010 05:06AM by casainho. I am sorry if I have not explained it well enough, I am glad to see someone get involved I will add some more to the wiki when I get time. needles, the sort that screw in, and cutting the end from the syringe tube and fixing it to the body, this would allow quick change nozzles, but not sure what the smallest size bore is yet. I would try a high frequency one, the sort from computer power supplies, not steel laminates but. No valves, just a tube from the reservoir to the head. 6Kh is on the dial on my box but thats not calibrated, the size and frequency of the bimorph will effect that number, so make your box have variable outputs to tune it, the reservoir needs to be set at the right height, too high and drips form, to low add it starves the printhead. I tried just tapping the wire as quickly as possible and it reacted instantly as far as I could see. Can you produce a prototype? You can have version2, As I said it needs a new nozzle but you are welcome to play with it, I shall make a new one. I saw it on wiki, it's ok I guess. But what if someone want to reproduce it? are any measures/dimensions that you found important? -- like you didn't characterized yet very well the nozzle hole, can you please do it? what is your guess, lower than 0.25mm? You mean that if we close with a valve the feed pipe it should be enough to stop the print (other than also stop electronic signal)? > Can you produce a prototype? > shall make a new one. I think it's important to get something simple, cheap and DIY, so others can replicate and test/use and report. So I guess someone (you??) should define, characterize the printhead (at least the mechanical part). Maybe as motivation, you could be interested in produce and sell the mechanical parts. What do you think? (there are others selling the mechanical parts on Ebay for RepRap). Edited 3 time(s). Last edit at 08/03/2010 01:46PM by casainho. I saw it on wiki, it's ok I guess. the new body so will have to order some. the nozzle size will depend on the material viscosity I think, for inks it can be small but for resins or varnish the resistance will be higher, so may have to be bigger?, thats why I want to try the syringe thing. I have not tried a valve, I suppose it would starve the flow but then their would be a slight delay whilst the fluid fills, just stopping and starting the signal stops and starts the jet I have found. 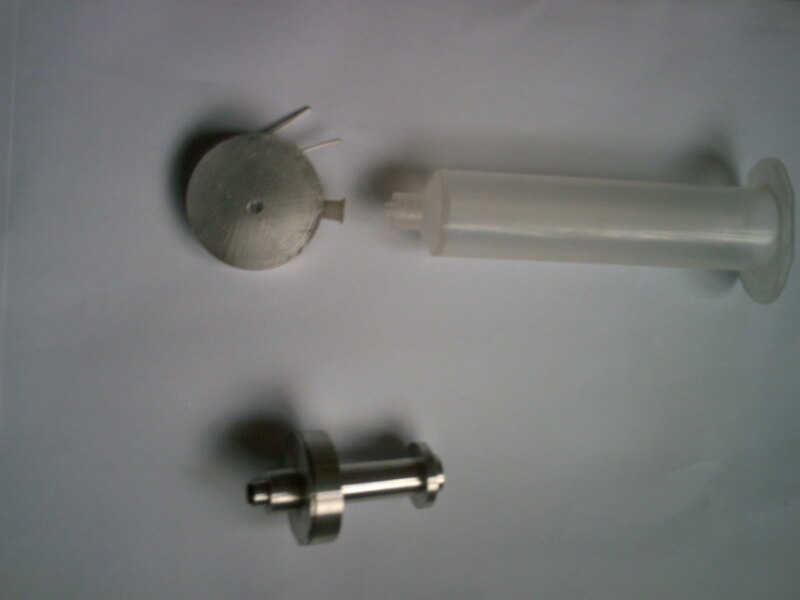 I would rather get things as good as we can, then try to simplify and make as cheap as possible, I use alluminium but plastic should work?, it may be reprapable apart from the nozzle?. No thanks, my motivation is to help others, [forums.reprap.org] I have stated work on this. I have looked at your blog, very good, I am OK with mechanical but rubbish at electronics, so the more help we get the better..
> I saw it on wiki, it's ok I guess. > the new body so will have to order some. > want to try the syringe thing. Ok, I will ask to reifsnyderb if he can drill such small holes. > than also stop electronic signal)? > parts on Ebay for RepRap). > have stated work on this. I still think that developing this kind of technologies in Open Source way and helping others to access them, it's a big help to everyone. > more help we get the better..
You just need then to focus on mechanical and let the electronics with me. Please find a relative good prototype and send it to me, I will do the same with electronics! the extra resistance from the needle, I can cut them shorter but we will see. Their are two types of syringe body adapter, one type just has a taper and the other has the same taper but with a thread to ensure a tight fit, on close inspection it appears there is a gap between the ends of the tapers, this is bad news, the gap would fill with fluid and interfere with the flow, a bit like putting something over the nozzle, what a shame, It would have been a neat solution, so far the only problem bit with this project has been the nozzles. As an apprentice I was sent to the stores for a glass hammer, a long weight and some 1/4 bsf holes, I still need some holes. Edited 2 time(s). Last edit at 08/05/2010 03:24AM by johnrpm. Looks to me that the middle pin of the piezo is a feedback signal that goes to circuit. When that signal goes over 0.7V, that 3 pins ic may be a transistor, and it turns ON, switching the positive wire of the piezo to GND. So this is the way to get an very simple and cheap oscillator, making the piezo to buzz. It works with low voltages of 3.3V, 5V and 12V(when I took that oscilloscope screens). The frequency of the oscillation should be done by the resistors values and the characteristics of that transistor. The sine wave of feedback signal is interesting, because the piezo is excited with a square wave but looks like is reaction is slow and so vibrates in in sine wave instead of that square wave. Edited 1 time(s). Last edit at 08/05/2010 05:36AM by casainho. that goes to the bottom of the bottle to then in port of the micro valve. to 5 PSI is goof don’t use more then 7 PSI. The micro valve works on 5 VDC. would give you seven micro valves, seven plastic tubing print nozzles. The frequency will be mainly determined by the resonant frequency of the piezo, not the resistors, and that is why you get a sine wave. The piezo is vibrating with SHM and the transistor is giving it a kick at the right point in the cycle. It is like pushing a child on a swing. 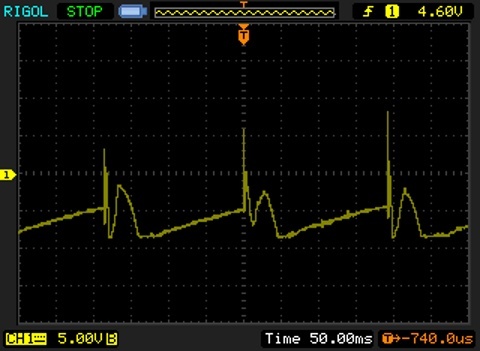 hint how to add delays in a stream of pulses coming to the microprocessor. valve. I hopes this helps with your project. Edited 1 time(s). Last edit at 08/05/2010 02:30PM by casainho. I went to Maplins to get some more bimorphs, they have gone up from 50p to 80p, they only had 4, 1.8hz and 2, 4.2hz in the rack. I have built similar pressurized systems similar to those above, but had a few issues, mainly to do with residual pressure, but all ideas are welcome. Can anyone point me in the right direction with a circuit, at present I can tune the head for a good output with frequency and amplitude settings, and would like to regulate the flow or maybe do dots and dashes, at some point it must be linked to gcode, mach3 can output pulses, turn on a relay or send step and direction from the S command, I don't know what emc2 outputs or the extruder control on the arduino, I hope this makes sense to someone, I am stating to babble aren't I.
Edit, I also bought a book on 555 circuits but would like some advice from the experienced if possible. Edited 1 time(s). Last edit at 08/06/2010 07:44PM by johnrpm. About the circuit, I think you should go simple and work with Arduino and power up the piezo directly from Arduino pin (5V) -- maybe with some diode in series or flyback to protect Arduino pin. Basically the software can be the same as for plotting. I think before we go to firmware and software, you need to test the print head with 5V PWM signal. Does it do a jet? how many mm long? How many time does it take to start and stop the jet? Does a signal of 5V works? 12V? -- just need to go for 12V if 5V do not work. Edited 2 time(s). Last edit at 08/06/2010 08:11PM by casainho. I have been putting in a kitchen worktop today so have not had much time, but have set things up to do the video tomorrow, one thing worth mentioning is the relative height of the printhead and reservoir, by getting the reservoir at the correct height it avoids the formation of a small dome of ink on the face of the nozzle, which is blown of when the printhead is turned on. I will look into this, it would make life easy but when I have tried low voltage the jet is more like a spray, then again I have been holding the paper by hand and moving it at different speeds and distances from the nozzle, if it were on a proper stand and under controlled conditions ?, I think that is going to be the next step. To be done, If you email me your address I will send you the printhead for testing after doing the video, I will then make another. Johnrpm - Thank you for all of the information that you have posted concerning the details of your print heads. My interest in experimenting with the print head is driven by the desire to experiment with making 3d prints using some of the powder recipes published by Open3DP. I currently have a couple of piezo devices on order and I'm hoping to attempt to construct a print head based on your designs in the next week or two. As my RepStrap is EMC2 based, with the print head stepper driven directly from EMC2 as the A axis, I'm planning on experimenting with driving the piezo directly from the A axis step pulse. If the drop size can be made small enough, I'm also interested in attempting to deposit materials for the construction of metal oxide based thin-film transistors, although that is a longer term interest. If you do end up with any extra print heads you want others to try out I would be interested in trying one. I would be happy to cover any costs for parts, shipping, etc. Madscifi, I hope it comes up to expectations for what you want to do, it needs a lot of development for the intended application, some applications need dots whilst others need jets, I think the electronics will need to be created to allow the different modes, at present its a bit like a water tap full on, by messing around with the signal it should be possible to get control of the flowrate. Bimorphs are just a start, I am sure that other piezo materials may be better, but bimorphs are a good starting point to learn the basics, for me the whole business of piezo was a black art, but when you start playing with things it all starts to make sense. Edited 1 time(s). Last edit at 08/08/2010 06:01AM by casainho. John, I put the video embedded on wiki page. I also added a feed to latest of this forum messages. On that video, the line on the paper seems to be very large. Do you think it's because of the moving speed of the paper? What was the hole diameter of the nozzle?